Hi ladies! I want to wish everyone a very safe and merry Christmas! I hope it's filled with good cheer, great food, presents and most importantly lots of loving family and friends =) Here's the simple Christmas manicure I'll be rocking for a quiet Christmas Day with my family. Pinky, middle and index fingers: 3 coats of Ozotic Pro 604. 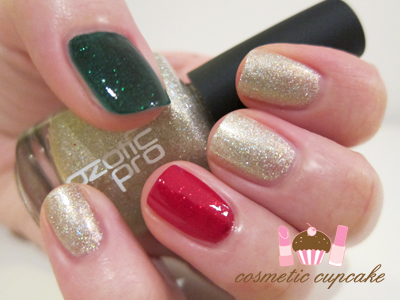 Another awesome holo from Ozotic Pro!! Ring finger: 1 coat of China Glaze Salsa and 1 coat of China Glaze Ruby Pumps. Thumb: 2 coats of China Glaze Emerald Sparkled. I love this! Its festive and cute! very nice, those are the perfect colours for Christmas. Yeah! Another OP swatch...what a nice Christmas present ^^ Have a wonderful Christmas!!! oooh meee likey very festive! Ooooooooooh!!! Great Christmas nails lady!! I just wore an Essie red, not nearly as creative as your look. Merry Christmas!! !